Yes! That is my akka (elder sister). That's how I call her. She is 3 years older than me. This photo was taken in front of our house where we grew up. The house is located in Watertank road in Nagercoil. Read this [link] to know more about this house. 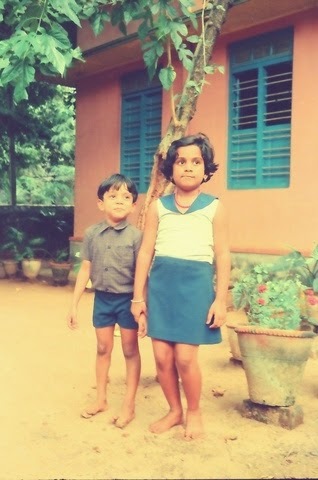 Akka and I were like India and Pakistan when we were children. I was Pakistan. She would punch me down with a single blow and I would run to Amma crying for help. The blue window behind us in the picture is a window that I would have climbed more than 1000 times. There is a sunshade above the window and a mulberry tree next to it. I will climb the window, hold the mulberry tree and climb the sunshade and get to the roof of the house. Those are unforgettable memories. A singer tailoring machine will be placed near this window. My mom would be stitching clothes for us most of the time in that machine. At nights, I would climb this window from outside with the hope of scaring my sister and my mom. 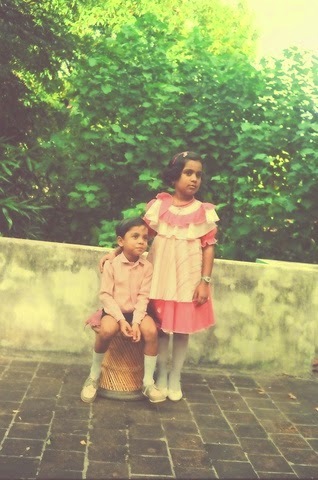 This is one of the dresses stitched by mom. My sister and I would wear the same colour combination to church on Sundays and to school on Fridays. Yes I used to wear tie all the time. I am showing my toothless aggression in this photo. I lost those tooth in a cross fire at the India Pakistan border. This picture where I am sitting on a moda is taken in the terrace of the house. My friends and I have played cricket with plastic ball, football with a bigger plastic ball in this place. My sister and I used to fight for that moda all the time. I would always been asked to sit on the moda. My mom would tell my sister "He is a small boy. Let him sit". When I sit on the moda I would feel like a King and when my sister stands next to me, I would treat her like the maid who stands behind the king and fans him with a peacock feather. All these photos are more than 20 years old. 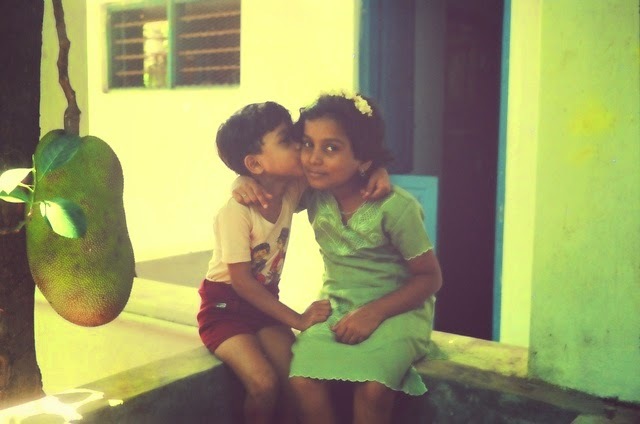 These photos are helping me a lot to remember my childhood in the 1980s and 1990s. That is the power of photographs. We had almost all the fruit bearing trees in our house. We had tender coconuts at arms reach. Mulberry, Mango, Sapota and custard apple were the other trees that served me with delicious fruits all the time. The big jack fruit tree at the back of the house is where I spent most of my evenings. On Saturdays, we would split open a big jack-fruit and our whole family will massacre the jack-fruit like four lions feasting on its catch. 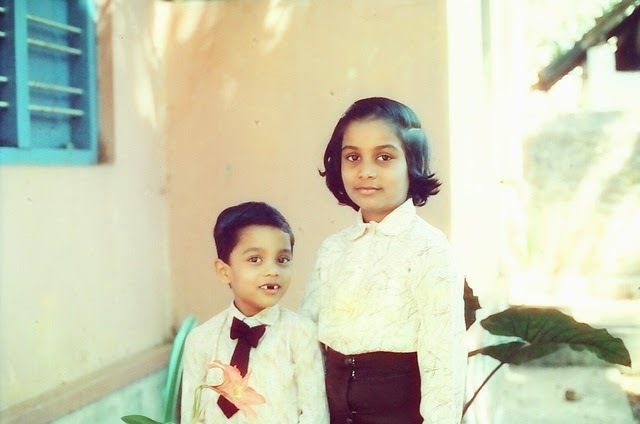 This paasamalar photo with my sister was taken just before we had a big fight for who should clean the water tank. She won as usual. Childhood memories are always a few of our best memories.... Well said!